I stopped by the post office in Luther this morning, ten miles into my ride, to mail home the stuff I enumerated in yesterday's post. The grand total weight was...drum roll please...6.5 pounds! That's nearly the weight of three liters of water! Maybe it was all mental, but it seemed that Shirley (my Surly bike) and I rode a wee bit faster today. Or perhaps the increased average speed was because of today's moderate temperatures. Or the flatter route. Or perhaps the tailwind. The reasons don't really matter to me. What matters is that I had an excellent day of riding! As I mentioned in a prior post, today was going to be a somewhere-in-the-40-mile-ish "rest day." 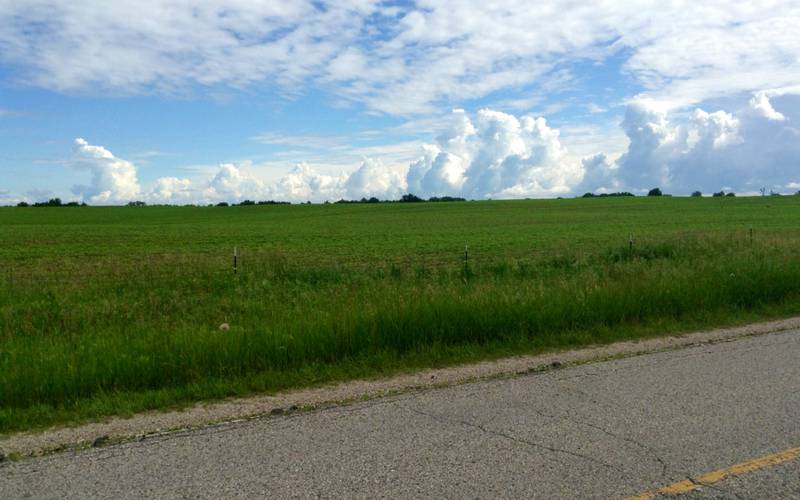 But the riding felt so good today that I decided to ride 30 miles further. Woohoo! I'm really enjoying the flexibility allowed by an open schedule. Now that I'm riding on my own and I no longer have any etched-in-stone dates that I need to make, I can let the ride dictate where I stay. For the first time since riding through Washington state (which seems like eons ago), I spent a good part of the day staring at the clouds. They were different in all parts of the sky. I enjoyed watching them evolve, against the perfect blue, as the miles passed. Surprisingly, I had my first encounter with dogs on this trip just yesterday. Even more surprisingly, I had my second and third encounters with dogs today. Seriously Michiganites, lock up your dang dogs! Fortunately none of the chasing episodes were all that scary. For me, at least. In all three instances, there were automobiles approaching in the opposing lane, and I was afraid that the cars would hit the dogs. In all instances, the automobiles were distractions for the dogs, and so they all stopped chasing me. Numerous glances over my shoulder confirmed that all the dogs made it back to their yards safely. Phew! 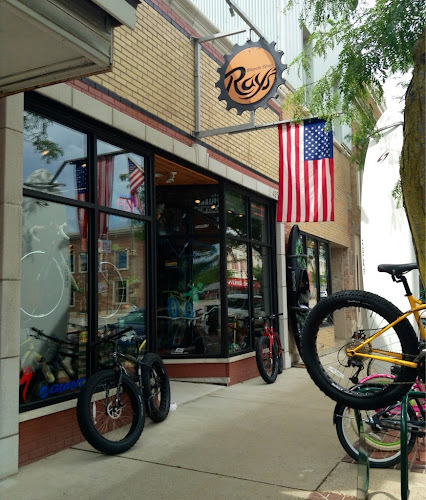 When checking out the availability of Warm Showers hosts over the next few days, I was surprised to see a bike shop listed - Ray's Bicycle Shop, in Clare, MI. The shop has a shower and offers the shower to cyclists passing through. I couldn't pass up this opportunity! The bestest, mostest awesomest bike shop. The folks at Ray's were all super helpful and super friendly. It's so cool when businesses extend themselves in seemingly simple ways. The "little things," like offering a shower, can make such a huge impact. Enjoying the hospitality of Ray's was definitely the highlight of my day. As was seeing all the fat bikes! 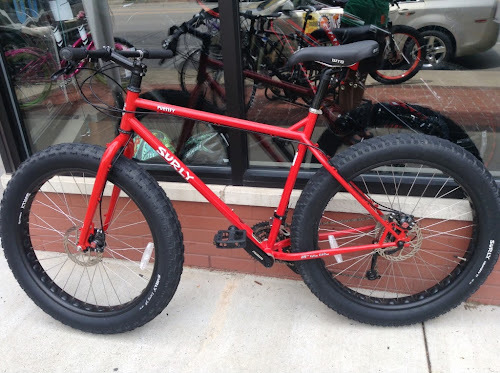 Surly's Fat Bike - the fatso Pugsley. And taking one for a test drive! Testing out a 9-zero-7. How do I look on her? Fat bikes are starting to become more and more popular. 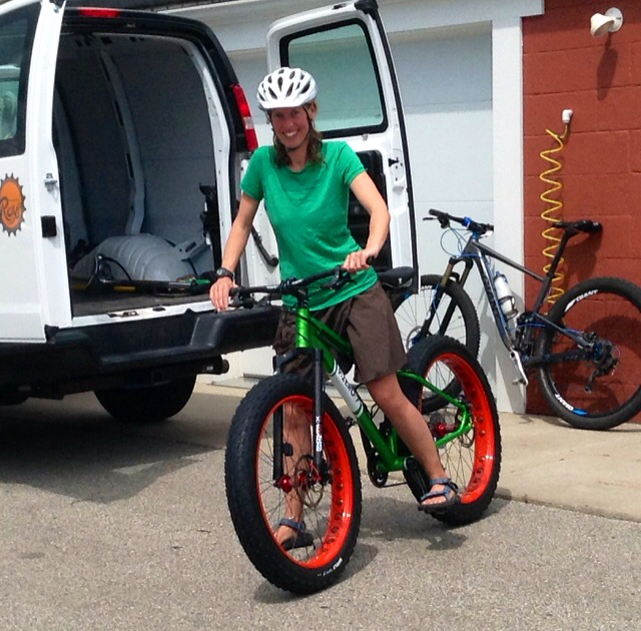 The bikes get their name from the super fat tires, which are up to 4" wide. The tires enable riders to easily manage difficult terrains, such as sand or snow. I so much want one of these! Of course, I'd have to have an awesome off-road cycling tour or two lined up pre-purchase to make sure the bike is put to optimal use. Anyone got any ideas for an off-road trip? Ah, I think I'm in love! 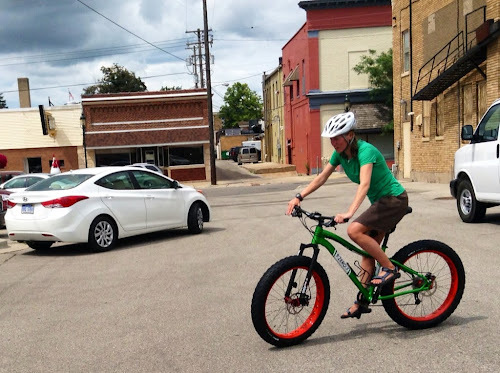 I nicknamed the above bike, "The Watermelon," because of its watermelon-green frame and its watermelon-red rims. With a price tag of $4,000, The Watermelon would likely be worth more than my car! The lovely staff at Ray's directed me to a city park about a mile up the road. The park allows for camping. I tell ya', this city has it figured out. I heart Clare, MI! I've been watching dark clouds dance in the sky all day. 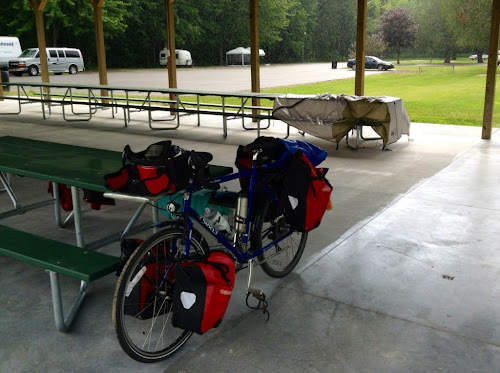 They dropped a few light showers on me mid-ride, but they decided to wait to dial it up to full-dump until just a few minutes after I arrived at the campground. I couldn't have asked for better timing. There's a pizza place next door. So, while I waited for the rains to lighten to grab dinner, I took the opportunity to dry out my rainfly (which was soaked from last night's rain) and to dry out some clothes that I laundered in the sink at Ray's. Of course, I was able to dry these things out thanks to the spacious picnic pavilion at the campground. Which has electrical outlets! At least my things can dry while it's raining. As the rains have cooled the temperatures quite a bit, I'm about to make some hot tea (using my water immersion heater). I'll then spend some time catching up on some reading before calling it a night. 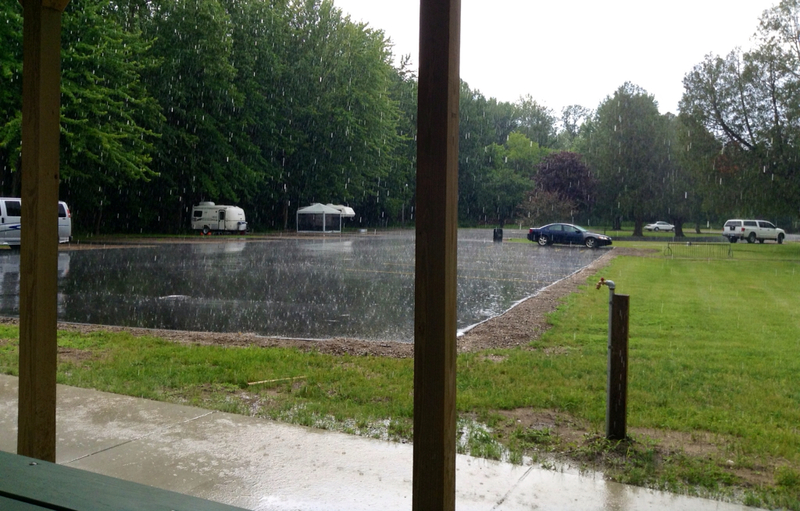 Despite the rain that continues to fall, I'm enjoying the opportunity to dance in the rain. The generous hearts of people such as those at Ray's are so very touching and make me want to do nothing more than pass it forward.